* The Agusta company of Italy -- later part of the Anglo-Italian AgustaWestland firm, now absorbed into the Italian Leonardo group -- got into the helicopter business by building license-built copies of the superlative Bell Model 47 light helicopter. License production was all very good, but the Italians wanted to build their own machines, resulting in the development of the sleek "A109 Hirundo (Swallow)". This document provides a history and description of the A109 series -- as well as its low-cost "AW119 Koala" derivative, and the scaled-up "AW139/149/169" follow-ons. * Agusta originally worked on developing their own derivatives of the Bell 47, gradually leading to the turboshaft-powered "A105" in the mid-1960s and the all-new-design "A106" maritime combat helicopter, both of which were flown as prototypes but which did not enter production. At the same time, Agusta was considering a civil helicopter of new design, which emerged as the "A109". Development took several zigs and zags -- for example, the initial configuration featured a single engine but was redesigned for twin engines to provide safety -- with the prototype "A109C" ("C" for "Civil") prototype performing its first flight on 4 August 1971. Ottorino Lancia was at the controls, accompanied by Paolo Bellavita, one of the design engineers. Obviously Bellavita was confident in the design. It was a sleek, sharklike machine with retractable tricycle landing gear, powered by twin Allison 250-C14 turboshafts providing 275 kW (370 SHP) each. Testing was halted for a time due to a minor accident, but resumed in 1972, with a second prototype and a static test machine joining the program in that year. The first two prototypes were followed in 1973 by a third, in a military configuration, and a fourth, in a preproduction civil configuration. There were delays and the first preproduction machine was not completed until April 1975. Certification was granted in that year and initial delivery of the production machine, the "A109A Hirundo (Swallow)" was in 1976. * The A109A provides a baseline for the series. As mentioned, it was an elegant, streamlined rotorcraft with retractable landing gear, featuring a conventional main-tail rotor layout. It was built mostly of light aircraft aluminum alloys, with a four-blade main rotor -- made of metal with honeycomb fill -- and a two-blade tail rotor, made of stainless steel, on the left side of the tailfin. A folding main rotor was available as an option. There was a ventral fin with skid under the tail. The twin Allison 250-C14 turboshafts provided 275 kW (370 HP) each. There were fuel tanks in the rear fuselage with a total capacity of 550 liters (145 US gallons). The gear assemblies all had single wheels, with the nosewheel castoring but loaded to return to the centerline. The nosewheel retracted forwards while the mainwheels retracted up into the fuselage, all using hydraulic actuation. There was a backup emergency hydraulic extension system. The main wheels had disk brakes. Single- or two-pilot variants were available; with a two-pilot variant, the pilot and copilot sat side-by-side. Maximum passenger load was 6, with a forward-facing bench seat in the rear and a forward- or backward-facing bench seat in the front. VIP variants had custom interiors but typically they featured four or five seats. There was a baggage compartment behind the cabin. There were forward-hinged doors on each side of the cockpit and on each side of the passenger compartment. The A109A could be kitted up for air ambulance duties, with two stacked litters and space for two medical attendants. An optional hook for sling loads could be fitted under the belly. Four packs for inflatable flotation gear could be fitted to the fuselage for over-water operations. * Following the A109A, in 1981 Agusta released the "A109A Mark II", the primary change being uprated Allison 250-C20B turboshafts with 300 kW (400 SHP) each and a correspondingly uprated transmission system. Other features included a modified tailboom, an improved tail rotor, more powerful hydraulics, updated avionics and control layout, more access panels, and a removeable floor in the baggage compartment. The initial Mark II was configured for passenger operations; it was followed by a utility version in 1983 with more primitive interior and instrumentation. A "wide body" variant was introduced in 1985, with a roomier cabin achieved by changing the configuration of the fuel tanks under the cabin floor and installation of bulged fuselage side panels. No airframe changes were involved, and it is difficult to tell a wide-body A109A Mark II from an ordinary Mark II. * While Agusta continued to update the A109A Mark II, an "A109K" was developed for military markets in the Middle East and Africa. The initial prototype of the A109K first flew in April 1983; it was essentially much the same as the A109A except for fit of twin Turbomeca Arriel 1K turboshafts, with 538 kW (720 SHP) each for improved "hot & high" performance. It was followed by a second prototype in March 1984 that was essentially a preproduction machine, featuring the Arriel 1K turboshafts -- plus a composite main rotor system; a new tail rotor; a longer nose for more avionics capacity; and taller fixed, shock-absorbing wheeled landing gear. It is slightly puzzling why the fixed landing gear was adopted; it may have been the case that the retractable landing gear was all very well for a machine that operated off of helipads, but longer and more robust landing gear was required for helicopters that couldn't be so choosy about where they landed. 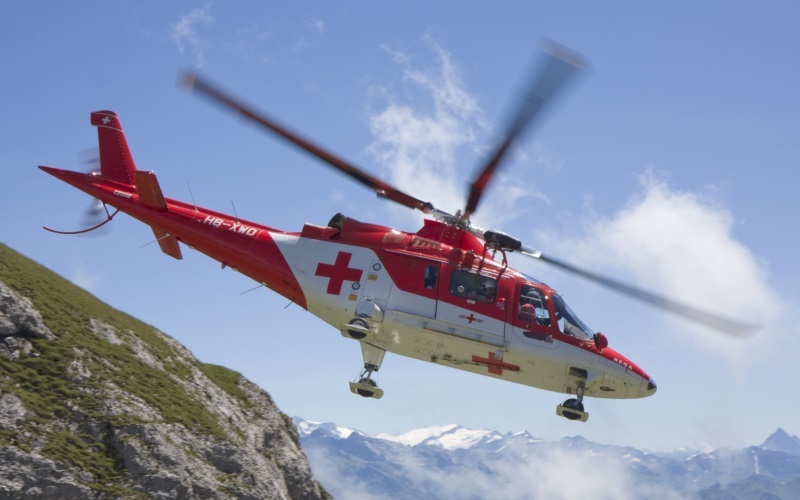 Sales in the Middle East and Africa didn't pan out, but an "A109K2" variant was sold to the Swiss REGA rescue service. These machines included a searchlight; a winch with a load capacity of 200 kilograms (440 pounds); single-pilot operational capability; Global Positioning System (GPS) navigation receiver and Israeli Elbit moving-map display; and a night vision goggle (NVG) compatible cockpit. * In the meantime, Agusta continued to sell and update the A109A Mark II, leading to the "A109C", which recycled the early prototype designation. The A109C, which was certificated in 1989, was essentially a wide-body A109A Mark II with uprated Allison 250-C20R turboshafts providing 335 kW (450 SHP) take-off power each; a composite main rotor, likely derived from that of the A109K, was also fitted. The A109C was generally similar externally to the A109A series and hard to distinguish from its predecessors. A medevac version, the "A109C Max", was introduced that featured big upward-opening bulged doors that allowed two stretchers to be placed across the cabin, with two medical attendants in the rear. The Max configuration was engineered by Custom Aircraft Completions in the US in partnership with Agusta. It appears that most or all A109C sales were of the A109C Max. * The split of the A109 product line into the A109C and A109K series proved unsatisfactory, and so in late 1993 Agusta decided to consolidate the two by introducing a new version, originally designated the "A109 Unified". A development machine, appropriately designated the "A109D", was built with Allison 250-C22R9 turboshafts, featuring full authority digital engine control (FADEC), and performed its initial flight on 1 October 1994. It led to a more definitive prototype of the "A109E", which performed its initial flight on 8 February 1995, with the A109D being converted into the second A 109E prototype. The first production "A109E Power", as it was designated, was rolled out in late 1995, with the variant obtaining certification in 1996. In 2000, Agusta and Westland of the UK decided to merge, and so the variant was redesignated the "AW109E". Although AgustaWestland became Leonardo Helicopters in 2016, the AW109E designation persists. The AW109E Power -- usually referred to simply as the "AW109 Power" -- was based on the A109K2 airframe but featured more powerful engines, initially the PWC P2206C turboshaft, with 477 kw (640 SHP) take-off power, now the Turbomeca Arrius 2K1 turboshaft, with 500 kW (750 SHP) take-off power. The fixed landing gear of the A109K2 was abandoned in favor of new-design ruggedized retractable landing gear. Unlike the main gear of the original A109A, the AW109E Power's main gear was stowed in sponsons, not the fuselage, and deployed shielded by a gear cover, giving something of a misleading appearance of fixed gear when extended. The tail assembly of the AW109E Power was considerably revised, with the tail fin of featuring a narrower profile with a "tab" at top; the ventral fin was retained but was smaller, with a tail rotor guard extension. Core avionics included a Rockwell Collins Pro Line II or Bendix/King Silver Crown suite. A color weather radar was optional, as was a belly sling hook with a load capacity of a tonne (2,200 pounds), a rescue hoist, searchlight, skis, an inflatable float system, engine fire extinguisher or engine filters, and various interior fits -- including standard passenger, utility, air ambulance, and VIP configurations. A relatively small batch of a luxury variant, the "AW109 Power Elite", was produced, featuring a high-class interior and more soundproofing. * The AW109 Power has been complemented by an uprated and slightly stretched variant, the "AW109S". Two prototypes were built, the first flying in 2002, and certification was granted in mid-2005. It was promoted as the "AW109S Grand" or just "AW109 Grand". The Grand has a larger cabin, improved rotor system and uprated gearbox, and twin uprated PWC PW207C turboshafts with FADEC, rated at 610 kW (815 SHP). It has a fully loaded weight of 3.17 tonnes (3.5 tons). Its external appearance is much like that of the A109E Power, but the 21-centimeter (8.5-inch) stretch permitted fit of a substantially larger rear passenger cabin window that provides a distinctive recognition feature. It also has a new tail rotor with tapered instead of squared-off blades. 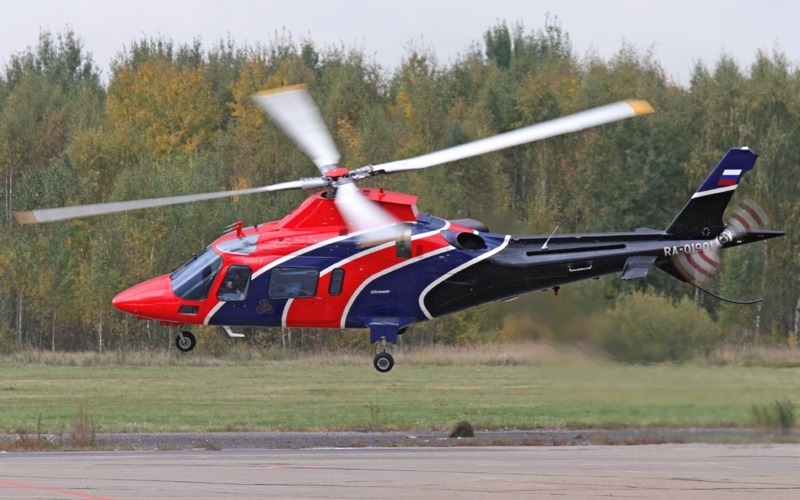 In early 2010, AgustaWestland unveiled an improved version of the Grand, the "Grand New". It had few if any airframe changes, but it featured a substantially enhanced avionics suite, including a night vision system, terrain avoidance system, plus an improved "smart" autopilot integrated with the avionics system. The Grand New is now the current main production version. It was joined in 2017 by the "AW109 Trekker", which was effectively a Grand with skid landing gear, plus the latest glass cockpit technology. The Trekker is being sold for public service and utility use, as opposed to passenger transport duty. * Agusta promoted military variants of the A109 from the outset, but though military forces did purchase the A109A & A109A Mark II, for some time they only obtained them for the utility role, the machines having no major differences from civil versions. It seems the Peruvian Army did obtain 12 A109Ks, but it is unclear if these machines had any combat optimizations. The first machines to be delivered in configurations suited to direct combat were based on what Agusta designated the "A109CM" -- powered like the A109C by Allison 250-C20R turboshafts but with sliding doors, plus fixed landing gear and a tail rotor guard like that of the A109K. Numbers of the A109CM were obtained by the armies of Italy and Belgium. The Italian Army obtained the A109CM as the "A109EOA" utility / scout helicopter, with "EOA" standing for "Elicottero d'Osservazione Avanzata". They featured a roof-mounted daylight sight with laser rangefinder, fixed landing gear, crew seat armor, defensive countermeasures, pintle mounts for door guns, optional fit of stores outriggers for unguided rocket and gun pods -- with a combination gun/rocket pod being one option -- crashworthy fuel tanks. 24 were purchased, including 16 "EOA-1" and 8 "EOA-2" machines, with deliveries in 1988. 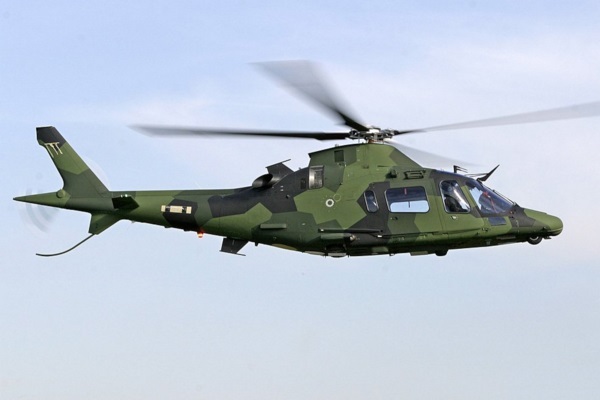 The Belgian Army purchased 46 A109CMs, appropriately designated "A109BA". They were locally assembled in Belgium by the SABCA firm, with deliveries from 1992 to early 1994. These machines had a general configuration along the lines of the Italian A109EOA machines but featured custom Collins / Alcatel Bell avionics. The batch included 18 scout machines, which were given the service designation of "A109HO", and 28 anti-armor machines, with the service designation of "A109HA". The scouts were fitted with a roof-mounted SAAB Helios stabilized observation sight; while the anti-tank gunships featured a roof-mounted Saab/ESCO HeliTOW 2 sight, plus outriggers for the carriage of twin quad TOW antitank missile launchers --, for a total of eight TOWs. * The AW109E Power has been sold in combat configurations, one of the more prominent users being the USCG, with their machines given the service designation of "MH-68A Stingray". These eight machines were fitted with flotation gear, searchlight, radar, EO/IR turret, and door machine guns to hunt down drug smugglers in high-speed boats. Interestingly, they are authorized only to use the machine gun for warning shots, though if a boat refuses to halt, a sniper puts bullets through the boat's engines. A military configuration based on the AW109E Power was also offer, being designated the "AW109 Light Utility Helicopter (LUH)", generally fitted with cable cutters and footracks for rappelling and the like beneath the cabin doors, plus options for a winch, spotlight, electro-optical / infrared (EO/IR) turret, armament, and so on. The LUH has sold well. In 2000, the South African Air Force (SAAF) ordered 30 AW109 LUH helicopters. 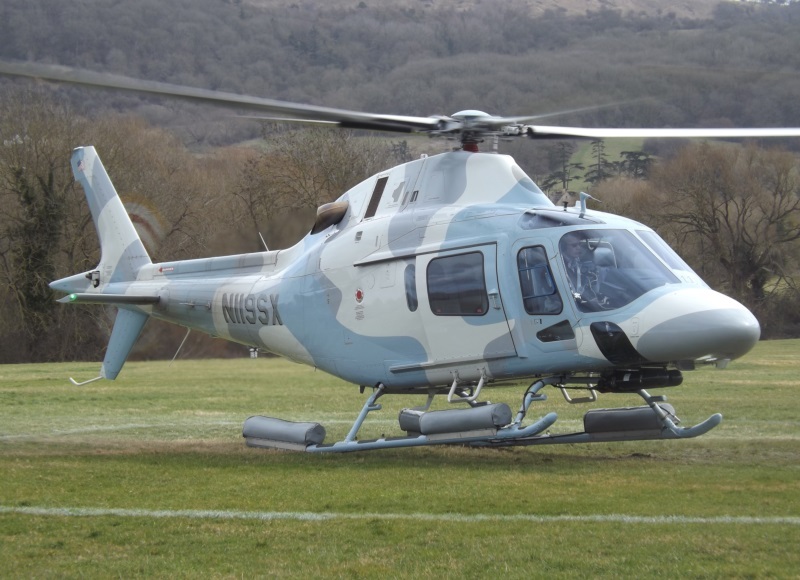 7 were to be supplied by AugustaWestland, with other 23 built by Denel in South Africa. As it turned out, Agusta only supplied 5 machines, with the other 25 built by Denel. The deal also included an option for ten more AW109 LUHs; it is not clear if the option was exercised. 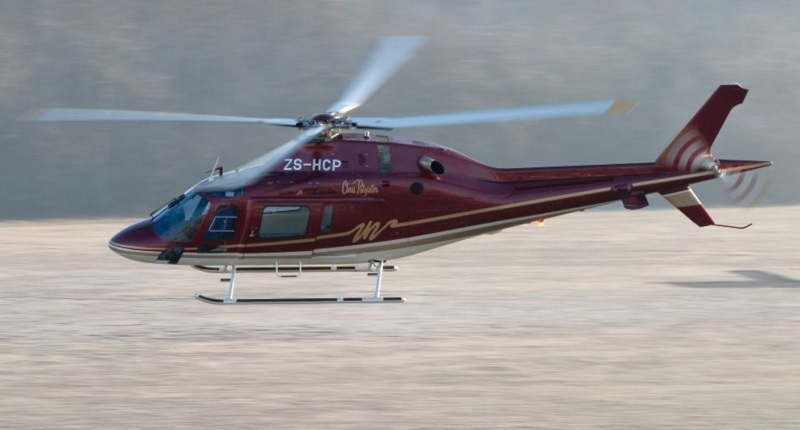 The original agreement with Denel evolved into a partnership, based on an agreement allowing Denel to market the AW109 and the AW119 Koala (see below) in a range of countries. Initial deliveries to the SAAF were in 2005. Photos show the SAAF machines fitted with cable cutters, door winch, and spotlight. In 2001, the Swedish Defense Ministry ordered 20 AW109 LUH machines, giving them the service designation of "Hkp 15", where "Hkp" of course stood for "helicopter" . Two subvariants were ordered, with 12 obtained as the "Hkp 15a" for land-based operation and 8 obtained as "Hkp 15b" for naval operation, off of VISBY-class corvettes. The Hkp 15s were intended for training, utility, search and rescue (SAR), and limited tactical use. Two helicopters were loaned to Sweden for evaluation in 2001, with initial deliveries of product in 2006 and final deliveries in 2009. All 20 were actually built by Denel. They featured Turbomeca Arrius 2K2 turboshafts with 595 kW (800 SHP) each, a door winch, and an advanced glass cockpit. The Hkp 15B had flotation bags, plus a shorter tail to permit it to fit into a VISBY's hangar. Other details were unclear; the Hkp 15b may have been fitted with nose radar and sources claimed it can carry a dipping sonar or other ASW sensors. Sensor inputs could be relayed to a VISBY corvette or other platform via a tactical datalink. 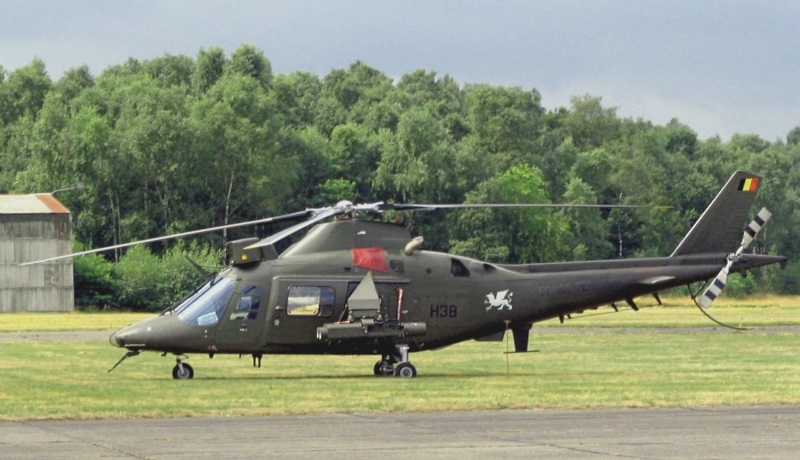 In 2003, the Malaysian Army ordered 11 AW109 LUH machines designed the "AW109 Light Observation Helicopter (LOH)", which as the name implies had a primary role as a scout helicopter, though it was also intended for utility use. First delivery was in 2005, last in 2006. These machines are fitted with Arrius 2K2 turboshafts; photos show them with a door winch, an EO/IR turret on the belly behind the mainwheels, and kitted up with stores outriggers, carrying unguided rocket and machine-gun pods. Five AW109 LUH machines were ordered by the Royal New Zealand Air Force, with deliveries in 2010:2011. * A number of other military variants of the Hirundo have been promoted, for example a battlefield electronics countermeasures (ECM) version and a maritime combat version, with 360-degree radar and capability for carriage of antiship missiles and torpedoes. There is no evidence the ECM version was ever built, but there are photos of a maritime-configured variant with a 360-degree radar drum on the belly and inflatable floats. It is unclear if this variant was a demonstrator or was in operational service. There are also photos of a militarized machine carrying a Mirach drone under each wing, apparently for reconnaissance; again, it is difficult to tell if this was a trials or operational fit. * With the A109 series proving successful, Agusta decided to develop a low-cost variant with a single engine and various simplifications, most notably skid landing gear. The result was the "A119 Koala", with the initial flight of the first of two prototypes in 1995. The prototypes were initially powered by a Turbomeca Arriel 1 turboshaft with 600 kW (800 SHP) but were later refitted with a PWC PT6B turboshaft providing 750 kW (1,000 SHP). A preproduction demonstrator first flew in 1999, with certification and first production deliveries in 2000. The "AW119", as it is now known, is very similar externally to the A109 except for the landing skids and narrower engine housing. It is mostly built of aircraft aluminum and features a four-bladed composite main rotor with titanium hub, a two-bladed tail rotor, and a ventral fin. It is powered by a PWC P6TB-37A turboshaft providing 745 kW (1,000 SHP) for take-off and has a fuel capacity of 606 liters (160 US gallons), stored in a three-cell fuel tank. Fuel capacity can be increased by adding one or two more cells, increasing fuel load to 721 liters (188 US gallons) or 871 liters (230 US gallons) respectively. The AW119 was introduced with a Bendix-King Silver Crown avionics suite. Accommodations are the same as for a baseline A109, with pilot and one passenger up front and a total of six passengers on twin bench seats in the rear. There is a baggage compartment at the rear of the cabin and a baggage hold in the rear fuselage. In EMS configuration, the Koala can accommodate twin stretchers and three attendants / sitting injured. Optional kit includes an NVG-compatible cockpit, cargo sling hook, fire-fighting system, snow skis, inflatable emergency floats, engine intake filter, searchlight, and LLTV / IR turret. 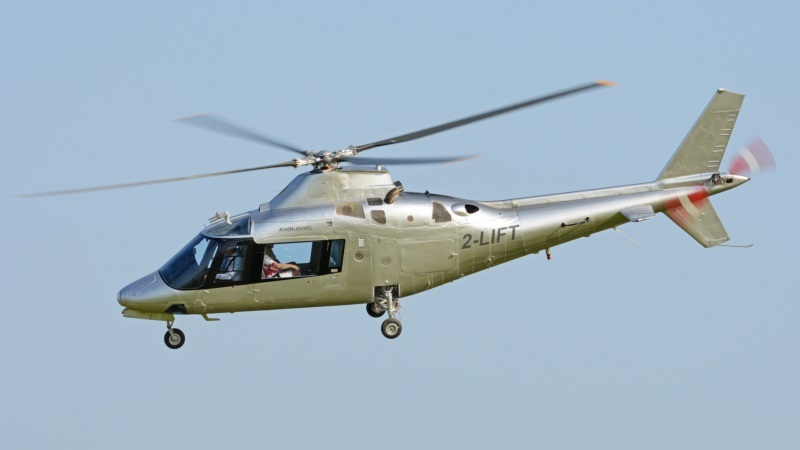 Denel of South Africa produces the Koala under license, for exclusive sales rights to markets in Africa and other undeveloped regions; as of 2004 all AgustaWestland production of the AW119 was transferred to the USA, at a plant in Philadelphia. The baseline AW119 was followed in 2007 by an "enhanced" variant, the "AW119Ke", with an improved rotor system to permit higher take-off weight, and landing gear reinforced appropriately. An "AW119Kx" was introduced in 2012 that featured a Garmin G1000H glass cockpit and generally updated avionics. Over a hundred Koalas have been sold to date. It hasn't proven popular with military services, the Finnish Borders Guards being one of the few armed force customers. * In 1998, Agusta and Bell Helicopters of the US set up an agreement to develop a new mid-sized helicopter, the "Agusta-Bell AB139". Initial flight of the first preproduction machine -- there was no prototype as such, apparently there was such confidence in the design that it seemed unnecessary -- was on 3 February 2001. It was followed by two more preproduction flight machines and a static test "tie-down helicopter". The initial preproduction machine was lost in a crash on 22 April 2002, but the program went ahead, with civil certification granted in mid-2003. In 2005, AgustaWestland bought out Bell's share in the program and the AB139 became the "AW139". 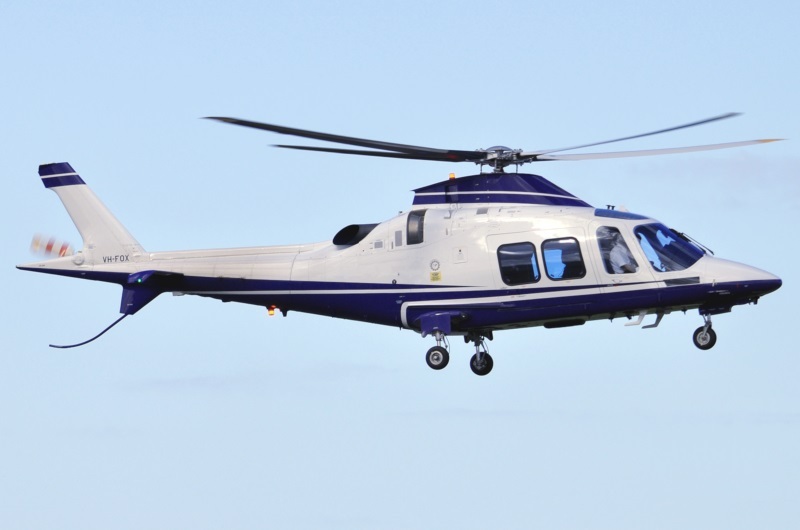 The AW139 suggests a scaled-up A109, featuring a maximum passenger load of 15 passengers or a maximum cargolift capacity of 2,500 kilograms (5,500 pounds). It is fitted with a five-blade main rotor and a four-blade tail rotor. It is powered by twin PWC PT6C-67C turboshafts with FADEC, each rated at 1,252 kW (1,680 SHP) for take-off. The AW139 is fitted with retractable tricycle landing gear, with a two-wheel nose unit and single-wheel main unit; the main gear retracts into sponsons. The AW139 features a glass cockpit, based on the Honeywell Primus Epic system with up to four color flat-panel displays, plus a digital automatic flight control system (AFCS). Passengers are carried in three benches of seats of five, two benches facing forward and one facing rear; VIP configurations range from four to seven seats. There is a passenger-accessible baggage compartment at the rear of the cabin. In EMS configuration, the AW139 can carry six stretchers and four attendants / sitting injured. There are hinged crew doors on each side of the cockpit, and sliding main cabin doors. Weight specs as per VIP transport configuration. Optional kit includes a cargo sling hook with a maximum load of 2,700 kilograms (5,950 pounds); external hoist; four-bag flotation system and externally-mounted life rafts; additional fuel tankage; NVG-compatible cockpit; searchlight; search/weather radar; EO/IR turret; cable cutters; as well as provisions for armament. 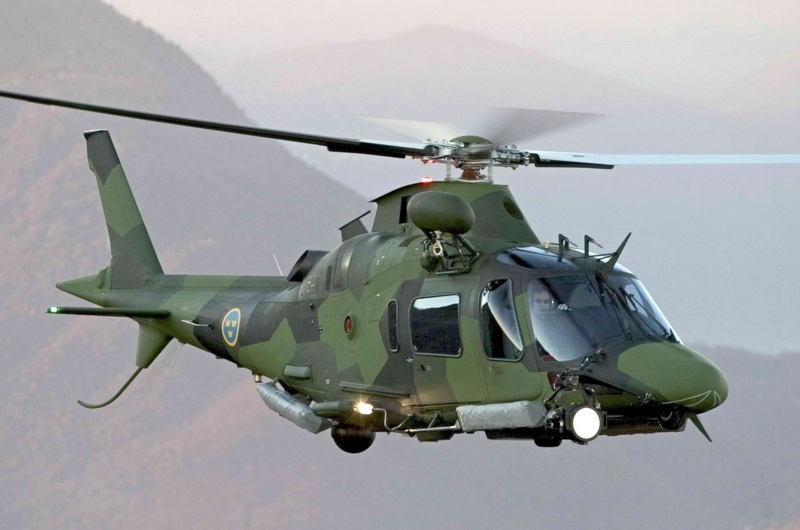 A militarized version, the "AW139M", is on offer, with the Italian Air Force having obtained ten "HH-139A" machines based on the AW139M for SAR duties, with deliveries in 2012. There have also been military sales to the Japanese and South Korean Coast Guards, Qatar Armed Forces, the Irish Air Corps, and the Egyptian Air Force. Boeing collaborated with Leonardo on an "MH-139" in a US Air Force contest to replace the USAF's Bell UH-1N Twin Hueys. The MH-139 won the award in 2018, with up to 84 helicopters to be obtained. * An "AW149" derivative of the the AW139 was announced in the summer of 2006, the AW149 featuring twin GE CT7-2E1 engines providing 1,492 kW (2,000 SHP) each, an uprated drivetrain, and a stretched fuselage. It is intended for military applications, and is capable of carrying up to 16 troops or several tonnes of cargo. Combat configurations will have a self-defense suite and modular armor. A demonstrator performed its initial flight in Italy on 13 November 2009, this machine featuring the AW 149 airframe along with the powerplant and dynamic system of the AW139. Military certification was in 2014; the first export customer was Thailand, which ordered five. 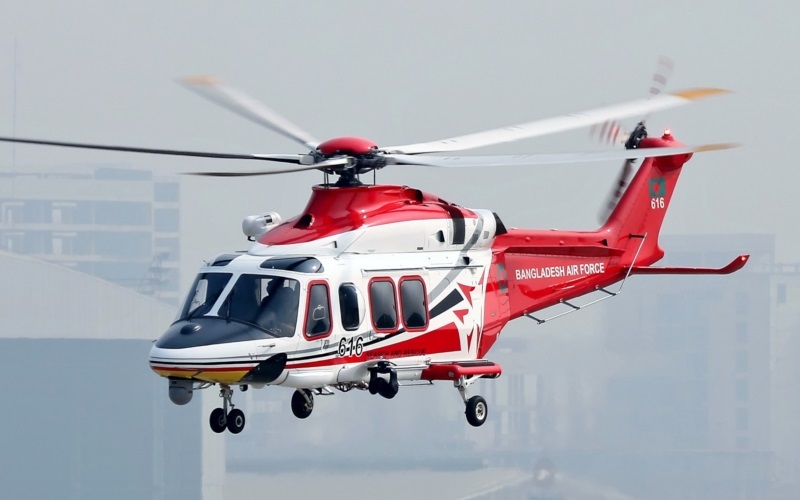 AgustaWestland also developed a civil variant, the "AW189", with the first of two prototypes performing its initial flight in late 2011, the first production machine flying in the fall of 2013, and deliveries beginning in 2015. It has been obtained by Bristow Helicopters of the UK, which performs coastal SAR under contract from the British government. * The "AW169" was announced in the summer of 2010 -- being a new-design twin-engine machine positioned between the AW109 Grand and the AW139, with a load capacity of 10 passengers. An "AW169M" armed scout configuration was also announced. Initial flight of the first prototype was on 10 May 2012. Three more prototypes followed, with production deliveries beginning in 2016. * The sale of the A109 to the Belgian Army was a prominent element in a major bribery scandal that rocked the Belgian Socialist government. The A109 sale had been allegedly greased by a payoff of 160 million Belgian francs to the Socialist Party; in the fallout of the affair, in 1995 Willy Claes, the Belgian secretary general of NATO, was forced to resign. Claes was convicted on corruption charges in 1998 and given a three-year suspended sentence; ten other Belgian Socialist Party workers got suspended sentences as well. The scandal also involved bribes to the Socialist Party from the French Dassault aviation company; Serge Dassault, the head of the company, got a two-year suspended sentence. The sentences were light because traditionally "donations" by manufacturers to political parties had been legal, there was some gray area due to relatively recent tightening up of the laws, and those were the maximum sentences available to the prosecutors. Not everyone got off so easily. Andre Cools, a Belgian politician who had once been deputy prime minister, told journalists he had "interesting" revelations on the case, but he never had the chance to tell anyone what they were: on 18 July 1991, not long after making that statement, Cools and his mistress were gunned down on the streets of Liege. Convictions were handed down on the murder over a decade later, investigators having "followed the money" along an incredibly convoluted trail of wide-ranging under-the-table deals and money laundering. Another interesting item was that the Argentine Army obtained ten A109s, exact variant is unclear, with three lost in the 1982 Falklands War -- one shot up on the ground, two captured and put into service by British forces. * I thought this would be a fairly straightforward document to write, but it turned out to be a bit tricky. The A109 is not all that well documented, and the trail is particularly confused by the fact that Agusta / AgustaWestland / Leonardo has promoted a large number of variants of the series, not all of which were actually flown -- and some those that were bought were obtained under different designations than those assigned by the company. * This article was put together by referring to several volumes of JANE'S ALL THE WORLD'S AIRCRAFT, the AgustaWestland website, and such as I could scrounge off the Internet from press releases and so on. v1.0.1 / 01 may 09 / Minor corrections. v1.0.2 / 01 may 10 / Review & polish. v1.0.3 / 01 aug 11 / Review & polish. v1.0.4 / 01 jul 13 / Added comments on AW189, Argentine A109s. v1.0.5 / 01 jun 15 / More on AW189. v1.0.6 / 01 may 17 / Review & polish. v1.0.7 / 01 apr 19 / Review & polish.